Tata Hexa: Classy, Macho, feature-rich? All your questions answered! Tata for sure has spent a lot of time to develop the Hexa, for it’s been quite long since we first saw the concept model. The Hexa is now real, and ready. There must be many questions erupting in your mind after seeing the new Tata SUV. Here are some answers. Is it an SUV or MPV? Tata markets the car as an SUV. The design layout of the exterior and the interior makes the Hexa fall in MPV segment. We feel that that the Hexa has harnessed best of both the worlds. It may sound little confusing but the Hexa is capable enough to be termed as an SUV and comfortable enough to be termed as an MPV. Yes, it’s a great crossover, just like the Mahindra XUV500. SUV Traits – 4-wheel drive with Limited Slip Differential on both the axles. Torque on demand. Driving modes (only with manual). MPV Traits – Easy looking exteriors, 7-seat layout with luxury comfort features that increases the weight and bring down off-road capabilities. Tata says that the Hexa has been redesigned completely but it still carries a very vague silhouette of the Aria. The Hexa sure looks butch from front three-quarter angle but from the side, it will give you a laid-back look. The strong body creases on the Hexa make it look it look muscular but it also throws a classy design language on the onlookers. The 19-inch alloy wheels and overall dimensions make the Hexa look very premium and expensive. For sure it will announce the status symbol of the owner. The only thing that may hold back the customers is the “Tata” logo on the SUV. In comparison to the XUV, the Hexa looks much larger and has better street presence. But it’s also more classy than macho. Even though the car is fairly powered, the 2280 kg kerb weight makes the Hexa a heavy weight to move on road. The XUV500 on the other is lightweight and does not have a big body roll. The clutch on the Hexa manual feels very light as compared to XUV500. However, finding the biting point on the Hexa can be little difficult at first because the clutch is not very progressive. The Varicor 400 engine is not a rev happy engine and makes huge noise with the manual transmission when you push it hard. The XUV on the other hand has quieter engine with the manual transmission. Things are much better on the Hexa Automatic. 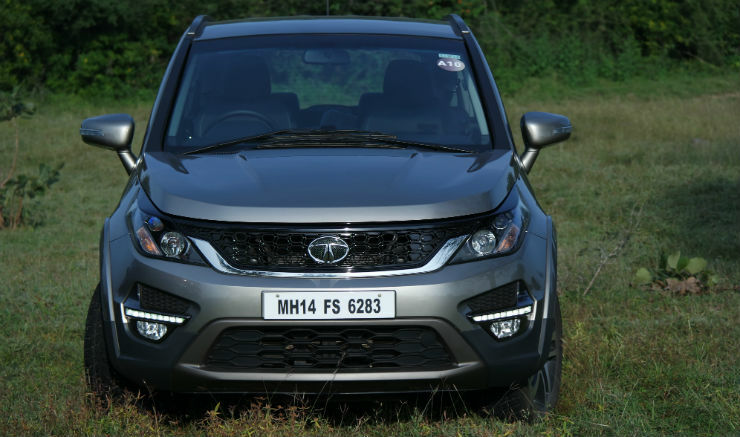 It seems like Tata has worked a lot to make sure that the automatic transmission is well integrated with the Varicor 400 engine and hence, the SUV feels like a charm with the automatic gearbox. There engine shifts are smoother and the engine noise also remains at a lower level with the automatic transmission. The Hexa has a lot of body roll. The car moves around a lot during corners but at the same time, it is very comfortable even through the biggest potholes. The XUV 500 on the other hand has less body roll and gives you confidence to do quick high-speed manoeuvres on the highway. We hope that Tata stiffens the suspension before the launch happens. Overall, the XUV500 is better to drive (pep, fun-to-drive factor and handling) but the Hexa has better ride quality. Oh yes, it’s simply the best in the segment. The major highlight is the ConnectNext infotainment system by Harman which gets support of 10 speakers from JBL. The combination translates into top notch sound-quality, stuff that’s comparable to luxury cars. The system can connect to your smart phone through an app. The infotainment system has a touch-sensitive infotainment system that gives access to navigation with off-line download and audio-video media in your phone. The phone can also be connected through regular Bluetooth. Features like mood-lighting and song selection can by done by the phone itself. All the three-rows of the SUV gets individual air-conditioning vents with selectable fan speed. The middle and the last row passengers also get access to individual 12V socket. The feature list does not end here. 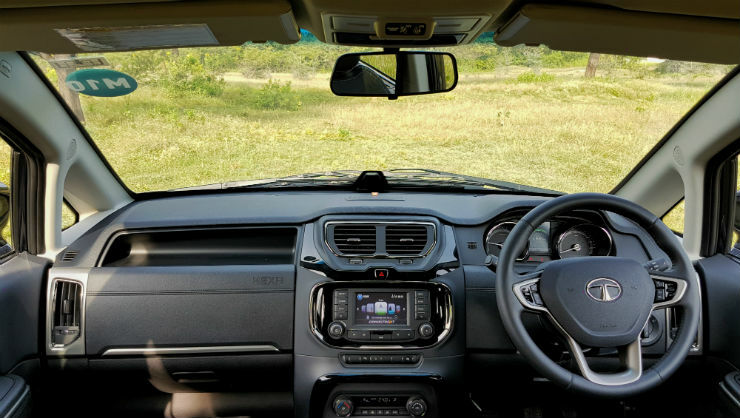 The Hexa comes with cruise control, reverse camera with guide lines, one-touch power windows for all four doors, retractable sun-blind on the rear doors, programable multi-information display, automatic twin-barrel projector headlamps, automatic wipers and more. The car is powered by 2.2-litre VARICOR 400 engine that also powers the Safari Storme 400. The 4-cylinder, turbocharged diesel engine develops a maximum of 154 BHP of maximum power and 400 Nm of maximum torque. There are superdrive modes with the manual transmission. It is similar to the Terrain Response system available with the Land Rover vehicles and can be set between Auto, Comfort, Dynamic and Rough Road. The modes can change the engine maps to lower the power output and switch between 4X2 or 4WD configuration. It also changes the traction control effectiveness to provide best driving experience on different road conditions. 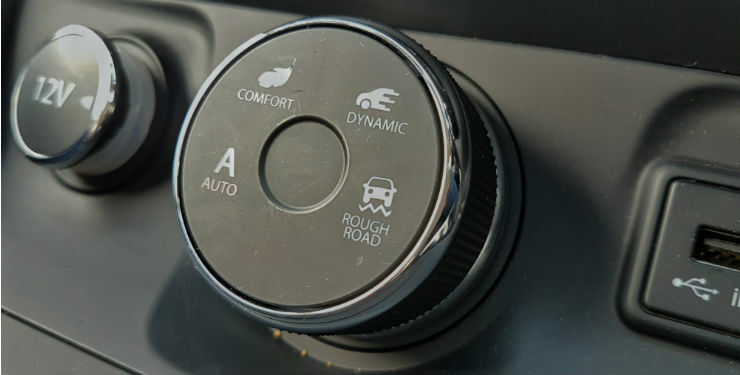 Both the automatic and the manual transmission comes with on-demand transfer case that supplies extra power to the wheel that needs it during challenging conditions or off-road drives. There are disc brakes at all the four wheels with ABS and EBD to start with. The SUV also gets Electronic Stability Program with Traction Control System. 6 airbags with curtain airbags with curtain and side airbags. The SUV also gets electronic pre-fill brake system as an added safety feature. This feature senses the throttle input and if it senses that the throttle has been taken off abruptly, it pre-fills the brake lines that in turn increases the braking effectiveness. Now we do not know what all of these features will be available with the base model. All the features mentioned above are of the top-end variant. Tata Hexa will face major competition from the Mahindra XUV500 and the recently launched Toyota Innova Crysta. To get past these two hurdles, Tata will have to set the pricing right. The base variant of the Hexa may lose a lot of features to get the right sticker price. We think the car will start at a price of Rs. 12 lakh. To automatic variant would not get a 4WD system but Tata has a transmission system that has even developed by the highly acclaimed, ZF transmissions and it is very expensive too. We must say that the transmission is brilliant. The automatic transmission has lower engine noise and also gets a sport mode, which holds on to the revs and gives you a brilliant response when driving enthusiastically. It can also be shifted to manual tip-tronic gearshifts. The automatic version of the car performed better than the manual one, and that’s something straight out of the luxury car domain. Enough to buy a car with Tata logo? The Hexa is surely a notch up, quality wise. The car has designed and developed after taking all the needs of the customers from the segment. It offers almost everything a car owner from this segment will look forward to. Tata has been working hard on their products and after market servicing to improve the customer satisfaction. The Hexa is worth your money if you are out in the market shopping in this particular segment. The Hexa offers premium features, good looks and a very commanding engine set-up. If Hexa is priced right, it can gain some good momentum in the segment and challenge the rivals (read XUV500 and Innova Crysta). « Mahindra’s future bikes to look like this; We like!